I've just started reading Michelle Paver's 'Dark Matter', which was passed on to me by a friend who'd enjoyed it, and which has been sitting on my TBR pile for a while now because I thought Halloween week would be a good time to pick up a story subtitled: 'A Ghost Story'. So far (Chapter 4) I haven't yet met any ghosts, but I am loving both the characterisation and the incredible sense of period and setting she creates. Having grown up on an eclectic reading diet, including 'Scott of the Antarctic' biographies and Jack London stories alongside 'Little Women' and 'Ballet Shoes', the whole Arctic setting felt very familiar. The snow, the wind, the cracking of ice, the wheeling gulls (which turn out to be kittiwakes) all rang more bells than seemed reasonable for someone who's never travelled North of Stockholm. Breaking News: My Novel is Accepted! Apologies if this is not the most coherent post ever, but I'm excited! Recently I sent my contemporary romance novel, 'Perfect Partners' to Crimson Romance (a clip of their website is below, but do go and look at the real thing - it's much prettier and has lots of good books on it) and they have accepted it for publication in 2013. Hooray! My novel 'Perfect Partners' is set in the glamorous world of ballroom dancing, and was inspired partly by my experiences on the Oxford University Ballroom Dancing team, longer ago than I care to admit, and partly by my love of Strictly Come Dancing. Which is on tonight - that's my plans for the evening sorted, then. I'll be spending the evening in front of Strictly - possibly with a glass of bubbly to toast my success... though the bubbly is banned until I hit my wordcount for the day... better get writing! Indeed it is the season for ghost stories, and if you like them, there's an interesting list of recommendations here. Halloween is just around the corner... Boo! Yes, Halloween is nearly here. The nights are drawing in, there's a nip in the air, the shops are full of pumpkins and black cats and gruesome edibles (gunky eyeball cake, anyone? 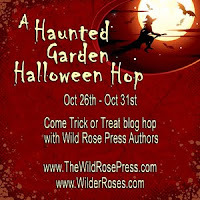 ), and the Wild Rose Press Halloween blog hop is coming up! Stop by nearer the time to read my thoughts on the dark side of writing light fiction, and for links to lots of lovely Wild Rose Authors writing about the season of spookiness. Published, as you might expect, quarterly, and packed with polished and thought-provoking stories (albeit with rather an American slant), it's well worth a visit, especially since it's free to read. The magazine is advert-free, and publication is subsidised by a small reading fee of $2 per submission. And why is it so named? Ah ha. Read it and find out! The site contains not only some great prompts (frequently updated) but also some wise thoughts about the use of prompts, such as a reminder not to get too hung up about hunting for the 'right' prompt. Reading 100 prompts in quick succession won't get the book written, and will mean that when you come to use those prompts in future, they're no longer as fresh and inspiring as if you were seeing them for the first time. You have been warned! Writing blurbs, or what makes a book sell? 1) Don't give too much away.